The grave of a man dating to around 2,300BC was discovered three miles from Stonehenge by Wessex Archaeology staff in May 2002. His grave was the richest from this period (the early Bronze Age) ever found in Britain and contained the country’s first gold objects. He was found during excavation in advance of a housing development at Amesbury in Wiltshire, and the man was dubbed the “Amesbury Archer” or the “King of Stonehenge” by the media. He has featured on several radio and TV programmes, including the BBC2 Ancestors series. This section gives full details, including the results of tests carried out in late 2002 to find out as much information about the Archer, and a second skeleton found nearby. The Amesbury Archer: pilgrim or magician? Who was the Amesbury Archer? Were the Boscombe Bowmen some of the builders of Stonehenge who came from Wales, or were they pilgrims to Stonehenge who came from France? To find out the full story purchase the e-book The Amesbury Archer and the Boscombe Bowmen - Bell Beaker burials at Boscombe Down, Amesbury, Wiltshire. On May 3rd 2002, archaeologists from Wessex Archaeology found the grave of a man dating back to around 2,300BC, the Early Bronze Age in Britain, at Amesbury in Wiltshire, England. The grave lay three miles south-east of Stonehenge. The grave contained the richest array of items ever found from this period. Around 100 objects were found, including the complete skeleton of a man, three copper knives, two small gold hair tresses, two sandstone wristguards to protect his wrists from the bow string, 16 flint arrowheads and five pots. This makes the grave the richest Bronze Age find in Britain - there are ten times the usual number of finds from other graves. The gold dated to as early as 2,470BC and is the earliest found in Britain. It seems likely that the objects were buried with the man, dubbed by the media the ‘Amesbury Archer', or the ‘King of Stonehenge', for his use in the next life. Tests on the bones showed that the Archer was a man aged between 35 and 45. He was strongly built, but he had an abscess on his jaw and had suffered an accident a few years before his death that had ripped his left knee cap off. As a result of this he walked with a straight left which swung out to the side of him, and suffered from an infection in his bones which would have caused him constant pain. Other tests on the enamel found on the Archer's teeth revealed that he grew up in central Europe. They could not reveal how long he had lived in Britain, only that he must have lived in the Alps region while a child, either Switzerland, Austria or Germany. The Archer is important because he is the first example of a powerful elite who may well have organised the erection of Stonehenge. Stonehenge was begun in the late Stone Age, around 3,000BC, as a ditch and a bank enclosing an open space, but in about 2,300BC the world-famous stones were erected, the large 20-tonne Sarsen stones from the Marlborough Downs nearby and the smaller four-tonne Bluestones from Preseli in west Wales. How the Bluestones were transported 240 miles (380 kilometres) is not yet known. On Friday May 3 2002, a team of archaeologists were excavating in advance of a housing scheme at Amesbury, Wiltshire, for developers Bloor Homes and Persimmon Homes South Coast. It is a requirement under planning regulations that developers have the land they are building on surveyed for archaeological remains and have these excavated. The archaeologists were expected remains from Roman times from a cemetery at the site which had yielded some interesting finds. Work in the area was drawing to a close when they began investigating the far corner of what would be a school built for the housing development. Work started in the morning and soon a grave was found containing Beaker pottery dating to 2,500 years before the Romans. Immediately all staff began concentrating their efforts on the grave. By mid-afternoon they found a gold hair tress. Excitement grew and the archaeologists pressed on, knowing they could not leave the site unattended over the weekend (a bank holiday) in case it was interfered with. They finally finished the excavation by car headlights at just before 2am. The Amesbury Archer had made a dramatic reappearance above ground. None of the archaeologists begrudged their overtime. For many this will have been the most exciting find of their careers. After the excavation was completed, the remains were taken the seven miles back to Wessex Archaeology's find department, where they were cleaned, recorded and analysed. They were later tested by Wessex Archaeology's own staff and by other organisations. These were: the British Museum, the National Museums of Wales and Scotland, the British Geological Survey, the National Trust Museum at Avebury and the Universities of Durham, Exeter, Oxford and Southampton. Wessex Archaeology contacted the media and within a few days the news had gone around the world, featuring on the BBC national news, the Daily Mail and magazines in Germany and Poland, among others. Papers were written for academic journals. When he died, the Amesbury Archer was 35-45 years old. His mourner's buried him on his left-hand side with his face to the north, and with his legs bent. His grave was large and rectangular in shape and probably had a timber lining. Buried alongside him were the accoutrements of a hunter, and symbols of status.His grave may have been covered by a round barrow common at this time (Early Bronze Age, 2,300BC). Some of the objects found in the grave hint at how he was dressed or adorned when he was buried. On his forearm there was a slate wristguard to protect the arm from the recoil of an archer's longbow. Next to the wristguard was a bone pin that may have held a piece of clothing such as a leather cloak or mantle. Partly covered by his torso was a copper knife which may have been worn in a sheath on the chest. Within touching distance of the man's face were two Beaker pots, a red deer spatula used for working flints, boars tusks, a cache of flints, and another smaller tanged copper knife (a tang is a protrusion which is used to fix the blade to the knife's shaft). Some or all of these finds are likely to have been in a small bag or container. The flints included scrapers, arrowheads, other tools, what may be a strike-a-light, and flakes that may have been blanks for arrows. Behind the man's back lay another Beaker pot, more boars' tusks, another cache of flint tools and flakes. Next to them was a cushion stone, upon which the Archer could work metal. Scattered through the grave but at a slightly higher level were 16 barbed and tanged arrowheads. The height at which the arrowheads were found hint that they were lying over the body rather than having been placed on the floor of the grave. Two more Beaker pots lay at the man's feet. By his knees there was another wristguard, another small tanged copper knife, a shale beltring, and two gold 'basket earrings.' These finds suggest that some pieces of costume were placed in the grave by the body rather than on it. Only the non-organic objects survive. The leather wood, and human flesh has long since decayed. It is likely that the items were placed in the Archer's grave for his use in the next life. He had everything that a person would need to survive - clothing, tools, weapons, pottery and spare flints to make new tools. The Amesbury Archer is important for many reasons. His grave is the richest of any found from the Early Bronze Age (about 2,400-1,500BC), the period that immediately followed the Neolithic, or Late Stone Age (4,000BC-2,400BC). This was a time when the first metals were brought to Britain, and the Archer was buried with two gold hair tresses which are the oldest securely dated gold ever found in Britain (dated to around 2,400BC). The Archer was important for another reason: he was buried three miles from Stonehenge at the very time when the massive stones were being brought to Salisbury Plain in Wiltshire to erect the world-famous monument. Stonehenge was begun around 3,000BC, as a ditch and a bank enclosing an open space, but in about 2,300BC the world-famous stones were erected, the large 20-tonne Sarsen stones from the Marlborough Downs nearby and the smaller four-tonne Bluestones from Preseli in west Wales. How the Bluestones were transported 240 miles (380 kilometres) is not yet known. It is possible that the Archer was linked closely to the stones: he may have had a hand in planning the monument, or at helping erect the stones; perhaps he was drawn to the area because the stones had just been erected. He would certainly have been well acquainted with the site, and other monuments nearby such as Woodhenge, Durrington Walls and Avebury. Perhaps the most significant fact about the Archer is that he was from the Alps region. He was most probably from what is now Switzerland, although it is possible he could have come from areas of Germany near Switzerland, or Austria. Archaeologists have long known that the distinctive Beaker pottery and artefacts which began appearing in Britain around the time of the Archer were from Europe. At first they thought this was as a result of an invasion, but more recently the attribute this to trade and cultural links. The Archer is thus example of people from abroad bringing the Beaker culture from the continent to Britain. He was more than just a trader, though. He came with the vital skills of metworking, and that would have given him great status in the eyes of local people. He would have been one of the first people in Britain to have been able to work gold. Hence the richness of his grave; he may not have owned all the objects placed there – some may have been put in by other people as a way of marking the his status. We do not know how long the Archer lived in Britain. It is certain that he spent his childhood in central Europe. The fact that the skeleton of a close relative of his who was found nearby, grew up in Britain suggests the Archer may have been here for some time. Lastly, the enormous wealth of the goods in his grave reveals to archaeologists the growing differences in wealth and status in society at this time; the Stone Age had been a time of relative equality. Dr Andrew Fitzpatrick, of Wessex Archaeology, said: “This was a time of great change in Britain – the first metals were being brought here from abroad and great monuments such as Stonehenge were being built. “We have long suspected that it was people from the continent of Europe who initiated the trade that first brought copper and gold to Britain, and the Archer is the first discovery to confirm this. The grave was probably lined with timber which has not survived. Any organic objects such as leather and human flesh would have rotted away. With around 100 objects, this makes the grave the richest Bronze Age find in Britain – there are ten times the usual number of finds from other graves. The gold dated to as early as 2,470BC and is the earliest found in Britain. It seems likely that the objects were buried with the man, dubbed the Amesbury Archer, or the King of Stonehenge, for his use in the next life. It may be that the grave was covered by a mound, or barrow which was subsequently flattened. Other tests on the enamel found on the Archer’s teeth revealed that he grew up in central Europe. They could not reveal how long he had lived in Britain, only that he must have lived in central Europe while a child, probably Switzerland, Germany or Austria. It is likely that the Archer wore animal skins fashioned into a cloak and was buried with pottery made locally, perhaps specially for his funeral. Also found close to the Archer’s burial was a second skeleton of a younger man, aged 20 to 25. Two gold hair tresses were found lodged in mud in his jaw. Bone analysis showed he and the Archer were related and it is likely they were father and son. The younger man was raised in the Stonehenge area. The tests were carried out by Wessex Archaeology’s own staff, the British Museum, the National Museums of Wales and Scotland, the British Geological Survey, the National Trust Museum at Avebury and the Universities of Durham, Exeter, Oxford and Southampton. The Archer is an example of people from abroad bringing the Beaker culture – with its distinctive pottery and the first copper and gold objects – from the continent to Britain. The enormous wealth of the goods in his grave reveals to archaeologists the growing differences in wealth in society at this time. Wessex Archaeology is a practice of commercial archaeologists based near Salisbury, Wiltshire, England. It provides a wide variety of archaeological services for clients including housing developers and heritage organisations. The services include excavation, evaluation, assessments of existing records, marine archaeology and building surveys. It is also a registered charity with a remit to educate the public in archaeology. It began in 1979 and employs more than 150 archaeologists. Another grave was found close to the Archer’s. Here archaeologists found the skeleton of a man aged between 25 and 30 dating from same time as the Archer. What the archaeologists did not expect was, as the skeleton was being cleaned in the laboratory, the discovery of a pair of gold hair tresses inside the man’s jaw. The new hair tresses were in the same style as the Archer’s. Only half a dozen finds of these earrings have ever been made before in Britain, so it was remarkable that the graves of two men with these symbols of power were found side by side. An analysis of the bones later showed that he and the Archer were related as they both had the same unusual bone structure in their feet – the heel bone had a joint with one of the upper tarsal bones in the foot. This proves they were related, and it is even possible that they were father and son, though this is not certain. Analysis of the oxygen content of the enamel in their teeth showed that while the Archer had grown up in the Alps region, his relative grew up in southern England. He may have spent his late teens in the Midlands or north-east Scotland. The Amesbury Archer lived around 2,300BC, at the beginning of the period classified by archaeologists as the Early Bronze Age (2,400BC-1,500BC). This followed the Neolithic (or Late Stone Age) period (4,000BC-2,400BC). The period was marked by the introduction of metals into Britain, at first copper and gold and later bronze (formed from copper and tin). The gold found in the Archer’s grave was the oldest found in Britain, dating to 2,470BC. The period saw the introduction of artefacts from the Beaker culture, marked by a new style of pottery, the use of barbed flat arrowheads, copper knives and small gold ornaments. Perhaps the most significant fact about the Archer is that he was from the Alps region. He was most probably from what is now Switzerland, although it is possible he could have come from areas of Germany near Switzerland, or Austria. Archaeologists have long known that the distinctive Beaker pottery and artefacts which began appearing in Britain around the time of the Archer were from Europe. At first they thought this was as a result of an invasion, but more recently they attribute this to trade and cultural links. The Archer is thus example of people from abroad bringing the Beaker culture from the continent to Britain. The enormous wealth of the goods in his grave reveals to archaeologists the growing differences in wealth and status in society at this time; the Stone Age had been a time of relative equality. At this time most tools were still made from stone. Copper was rare and too soft to be effective as a weapon – the Archer’s three copper knives were most likely for show. This was a society of people who were farmers, growing crops such as wheat. A few families would have lived together, though nothing like towns or villages would have emerged. This was also a time when some of the great monuments were extended. The stones were brought to Stonehenge at this time, for instance. Although the Archer was probably from what is now Switzerland or Germany, these countries did not exist at that time. The Archer may have spoken an early form of Celtic. What kind of a bow did the Amesbury Archer use, and how powerful was it? Only a very few prehistoric bows have been found in Britain and Ireland. The earliest one dates to around 4000 BC and was found at Rotten Bottom, in the Moffat hills in south-west Scotland. This was a single-piece yew flatbow, which had probably broken during a deer hunt in the hills. The Amesbury Archer's bow may well have been of a different kind - shorter, curved, and possibly made of more than one material. Such bows were adopted from Europe around 2500 BC, and used alongside the older type. Other novelties adopted from Europe were a new kind of arrowhead, with a tang (for attachment to the arrowshaft) and barbs (to help the arrow stick in the target), and fancy stone wristguards. These protected the wrist from the bowstring as it snapped back after a shot. The Amesbury bow need not have been particularly powerful. If used for hunting, or even for combat, the archer would have tried to get as close to his prey/enemy as possible, to ensure that the arrows struck their target. Also of interest is the shale ring, which might have been from a belt or strap - perhaps even the strap for his quiver. Oxygen isotope analysis of dental enamel can assist in determining a persons place of origin. Tooth enamel stores a chemical record of their owners’ childhood living environment, such as local climate and geology. Each tooth opens a window of information covering the short time of tooth enamel formation. The mineral apatite that makes up the structure of our teeth and bones is the main component of tooth enamel. Its chemical composition is primarily calcium, phosphorous and oxygen with trace amounts of other elements including strontium and lead. Of these elements the isotopes of oxygen and strontium are the strongest independent indicators we have of the local natural environment. Nearly all of the oxygen that goes into the formation of tooth and bone comes from the water we drink and virtually all the water we drink is ultimately derived from precipitation as rain or snow. The element oxygen has 3 different forms called isotopes, which are chemically the same, but have slightly different physical properties due to a small difference in their weight. The oxygen isotopes ratio of the water you drink depends on the source of the water in precipitation, the distance from the coast, latitude and altitude and the local temperature of precipitation. For our purposes we are interested in the ratio of heavy (oxygen 18) to light (oxygen 16) isotopes. Drinking water in warm climates has more heavy isotopes (higher ratio) and in cold climates has more light isotopes (lower ratio). We can compare the oxygen isotopes ratio in teeth with that of drinking water from different regions and determine where a person might have lived, at the time their teeth formed. Oxygen isotope analysis of dental enamel from the two burials at Amesbury indicate that the “Archer” came from a colder climate region than we find in Britain today, possibly from some where in central Europe - the dark blue-green area in the oxygen isotope map. An early formed tooth from the younger man has an oxygen isotope value that is compatible with living in southern England or Ireland but the value obtained from his wisdom tooth suggest that he may have spent his late teens in the Midlands (yellow area on the map) or north-east Scotland (mid green area on the map). However these results for the younger man do not rule out a European origin. Visitors to this website are granted permission to access this BGS material and reproduce it for the purposes of academic research, private study and educational or instructive use only. The five Beaker pots from the grave are an exceptional group, both in terms of number of vessels and quality. No other single burial has so many Beaker pots as grave goods, the most common number of Beakers in a grave being one. The pair of pots in front of the Archer’s face are almost identical. Both pots are decorated with horizontal lines of ver fine plaited cord, pressed into the clay when damp. This is an unusual form of cord decoration in both Britain and Europe. Neither of these pots seems to be complete. This may be because the pots were not well-fired, which in turn may be because the potter was aiming to produce a darker finish than the orange-red colour that is usual on Beakers. Producing a darker colour is more difficult than going for a full oxidising firing and may have led to under-firing. If that is so the pots are unlikely to have stood up to much use before they were put in the grave, and so it is likely they were made for the funeral and burial. Two of the other vessels may also be a pair, made by the same potter or potters working closely together. These are a Beaker with all over comb decoration and a Beaker of very similar form and fabric which is decorated with horizontal lines of comb impression with attached ‘fringes’ of triangles pendant or upstanding from the groups of horizontal lines. This ‘fringe’ motif is a very Scottish phenomenon which makes its appearance in Wiltshire unusual. The remaining Beaker carries all-over single cord impressions as horizontal lines. The vessel seems slightly more worn than the others and it may be an older pot used by the Archer or his family and not made specifically for burial. Dr Tom Higham works at the Oxford Radiocarbon Accelerator Unit. He administers the Unit's archaeological dating programmes, and is the secretary to the NERC Oxford Radiocarbon Accelerator Dating Service advisory panel. His research interests revolve around archaeological dating using AMS, including colonisation and settlement in the Pacific Islands, the application of Bayesian calibration methods to archaeological dating, sample pre-treatment chemistry and dating novel sample types. Dating the Amesbury Archer was an important part of the overall archaeological research programme. Samples of bone from both the Archer and his companion were AMS radiocarbon dated at the Oxford Radiocarbon Accelerator Unit, University of Oxford. In addition, another burial found nearby was also dated to determine whether it was the same age as the Archer, or whether it represented a later phase of burial activity at the site. The first stage in the process of radiocarbon dating using AMS (Accelerator Mass Spectrometry) is to drill a small sample of bone powder from the bone itself. This is achieved in the laboratory using an electric drill. Before drilling the exterior of the bone is carefully cleaned and then about 500 milligrams is drilled. The bone powder is pretreated and cleaned over about 4 days. First, a dilute acid is used to remove the carbonate fraction of the bone, which accounts for about 75% of its entire mass. Studies have shown this material is unreliable for radiocarbon dating. Then, the collagen fraction is isolated and purified using filters. The purified collagen extracted from the Archer weighed about 30 milligrams. This collagen is then converted into carbon dioxide in a combustion furnace, and finally converted into graphite, before being radiocarbon dated. The Oxford Radiocarbon Accelerator Unit has recently installed a new state-of-the-art AMS machine. This machine was used to date these bones, which were amongst the first samples to be analysed using it. AMS enables each carbon-14 atom in the sample to be counted directly, so the measurement process only takes an hour or so. A radiocarbon age is calculated by comparing the sample activity with that measured on standards of known-age. Both the Archer and his companion were dated twice, to add greater confidence to the final date. The results were consistent and in good agreement, and suggested that both individuals date to the middle part of the second millennium BC (2400-2200 BC). The third burial produced a much later result of 1700 years before present. Further dating work is being conducted in an attempt to determine whether or not the Archer and his companion were in fact direct contemporaries or separated by a period of time. The skeleton of the Amesbury Archer with his grave goods are on permanent display at Salisbury and South Wiltshire Museum. 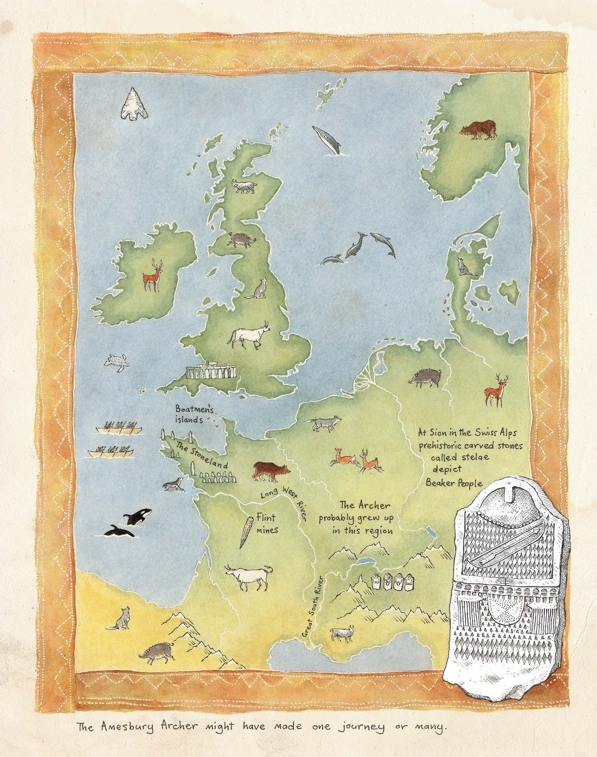 We are delighted to see the publication of Archer, Journey to Stonehenge by Jane Brayne – an illustrated adventure story for children set in the Beaker period. Jane drew the original reconstruction drawings for the Amesbury Archer and was inspired to interpret the story for children. You can find out more about the book and Jane’s illustrations by visiting her website.